Prostate cancer has long been considered an “old man’s disease.” But Gabe Canales was diagnosed at 35. The former Houston marketing and PR executive didn’t even know what a PSA was until such an inadvertent test of his blood led to a biopsy, revealing a low-grade prostate cancer. After meeting top physicians across the country, Canales became educated about the anticancer lifestyle and learned that his own cancer, currently under active surveillance, could have been prevented. That galvanized Canales into awareness – and action. He quickly launched the non-profit Blue Cure Foundation, which educates and empowers all men “but especially a younger generation.” Canales wrote in the Huffington Post Prostate Cancer Prevention Begins When Men Are Boys and has led a clarion call that the conversation must change with a greater focus on prevention. 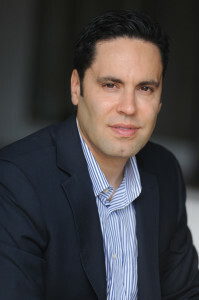 As founder, president and spokesman for Blue Cure – the men’s side of women’s “pink” movement for breast cancer – Canales has spoken at conferences across America and has appeared on media in New York, Los Angeles, Seattle, Portland, Houston and other cities to alert people that America’s top cancer killer of men must be stopped. With Blue Cure now his life’s work, he continues to use his PR and marketing skills to spread that word. A contributor for the Houston Chronicle and Huffington Post, Canales urges younger males to adopt healthier anticancer lifestyle habits at an earlier age, to become educated on chemicals in our foods, bodycare products and environment, and to become proactive consumers. Canales also encourages and educates men going through the prostate cancer journey to take an integrative approach, changing dietary and lifestyle habits and engaging in stress management. Blue Cure also shares news on research and treatments, including integrative treatment options, and has an online support group for thousands of survivors and their families. As a blueprint for reaching a younger generation through sports, Canales – via Blue Cure – launched seven Houston AAU Blue Cure basketball teams targeting youth in elementary, junior and high school. Canales shares Blue Cure’s message with parents and players, inspiring them to adopt a healthy and active lifestyle while playing with purpose. Canales plans to take Blue Cure teams to other cities. Canales also is working with Houston Baptist University and the University of St. Thomas to educate faculty, students and their families and looks to share the empowering Blue Cure message on college campuses across the country. Many professional athletes and business and civic leaders believe in Blue Cure’s message. Support comes from Houston Texans Chris Myers, Matt Schaub and Arian Foster, NBA World Champion Miami Heat player Shane Battier, Houston Mayor Annise Parker, Houston Mayor Pro Tem Ed Gonzalez, Sugar Land Mayor James Thompson, corporations like PHI, Inc., Drayton McLane, The Fant Foundation, MD Anderson Cancer Center and others. Canales also recognizes the urgency of reaching American workers and in September and October 2013, will partner with PHI Air Medical, a leading air ambulance provider in the country, to launch a campaign that will reach well over 55 communities across the US. The campaign is designed to help educate and provide information to employees and members of these communities with dietary and lifestyle tips on cancer prevention. Each year, another 240,000 brothers, husbands, sons and fathers are diagnosed. Canales believes many of those cancers are preventable, via smart dietary and lifestyle changes. While Blue Cure supports continued research for a cure, its unique emphasis is pro-active preventative measures to stop cancer from starting in the first place – measures which can save many thousands of lives. This all underscores that Canales is a visionary seeking to change the cancer dialogue and save lives. Blue Cure truly is a new cure – the cure of prevention.